Every once in a while we order pizza for our end-of-month lunch at work, and it is a challenge to find the right mix of toppings for a group that contains vegetarians and various allergies. I usually ask around to get a general idea of what will fly before I place the order. The last time, when I asked one of my more challenged co-workers what pizza she could eat, she said "chicken." When I asked what she liked with it, she said "Just chicken. Nothing else." I didn't think that would work well for everyone, so I just ordered chicken on half of a pizza. To my surprise, it was the first to go and folks were commenting on how good it was. So I think I will order a whole one next time. And it got me thinking about my tendency to overdo in the kitchen. Whenever I start to think of a new combination of flavors, I start with two things that will go well together but before I know it, I keep adding items until I have created a virtual monster. And I will often end up with a mish-mash of flavors that add up to much less than the sum of their parts. So I decided to make a chicken pizza. A just-chicken pizza. And it was fantastic. The sauce and cheese created the perfect backdrop to let the chicken shine. Sometimes less truly is more. Make pizza dough. Move a rack to the bottom slot of the oven and preheat it to 550 deg. F. Shape the dough to the desired size. Top with the sauce and season with salt and pepper. Add the mozzarella cheese and the chicken, then spread the Parmesan cheese over everything. (If you are making two pizzas, use half of the ingredients for each pizza.) 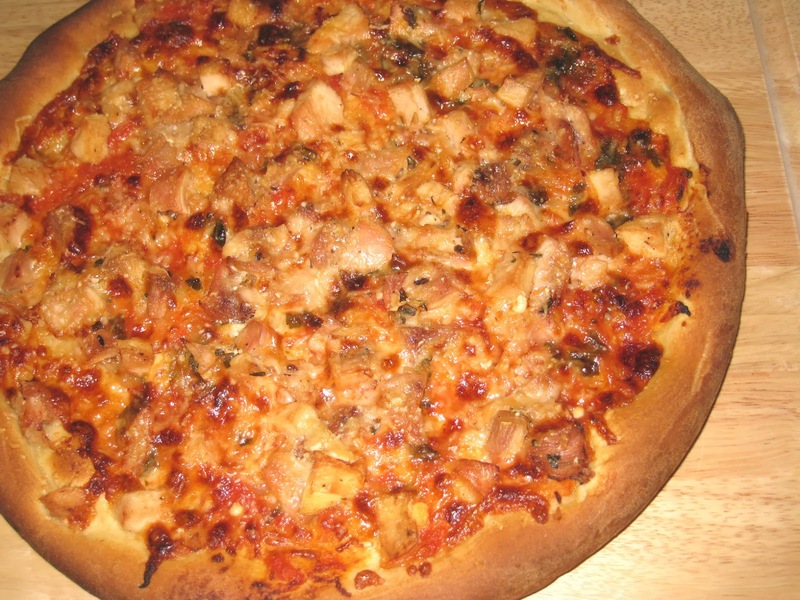 Bake the pizza for 18 to 20 minutes, until it is browned and bubbling. Combine the flours, salt and sugar in a small bowl and whisk together to mix well. Place warm water in a large bowl and add the yeast, whisking it together. Add the oil, and then the flour mixture and stir with a wooden spoon until the dough comes together. Turn the mixture onto a floured surface and set the bowl aside. Bring the dough together into a ball and knead, sprinkling more flour over the dough if necessary, until the dough is smooth and elastic and is just at the point where it is not sticking to your hands. Try not to add too much flour. Cut in half and make two balls. Dust with flour and put each ball into a plastic bag (leaving room for it to rise) and put the balls in the refrigerator until you are ready to make the pizza. If you are making the pizzas right away, then just put the dough in an oiled bowl, turning it to make sure it is covered with the oil, and let it rise until doubled, about one-and-a-half hours. You can also freeze the dough at this point. Just give it time to defrost before you get to work. Follow the directions for the pizza you are making.